Why should you make it – Spaghetti is a delicious and healthy choice for your kids. 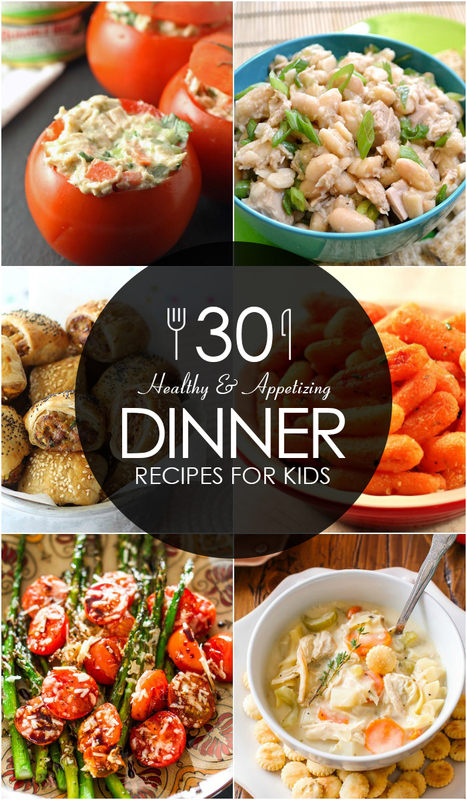 It works as a filling and hearty dinner for the kids as well as adults. The juicy and savory meat balls perfectly complement the pasta while the parmesan cheese adds a rich and creamy texture to it. The spices and herbs heighten the flavors of the dish. Beef – Beef is one of the healthiest of red meats that works as a powerhouse of proteins, vitamins and minerals. Zinc – Boosts the immune system and helps in faster healing of wounds. Phosphorus – Essential for strong teeth and bones. Spaghetti – Whole grain or whole-wheat spaghetti is an extremely powerful source of carbs and health-benefitting nutrients. Why should you make it – This homemade meatloaf is packed with delicious mozzarella cheese and it contains no added flavorings. It is made using a few basic ingredients but the end result is simply wonderful. Your kids won’t be able to resist the mouth-watering smell and taste of the meat loaf. Mozzarella cheese – Made from pure cow milk, mozzarella is a great source of protein, vitamins and minerals. Why should you make it – This creamy and comforting chicken noodle soup is a great way to add move vegetables to your kid’s dinner. It is a wholesome and nutritious meal that packs only 200 calories per serving. It is ideal for those chilly nights when kids don’t want to come to the dinner table. Chicken – Chicken is the most versatile white meat that is packed with high-quality protein and other nutrients. Carrot -This amazing root vegetable in an amazing source of vitamin A, C and other nutrients. The antibacterial and antiseptic properties of carrot boost your kid’s immunity and trigger the functions of the white blood cells. Why should you make it – Give your kids the goodness of fresh veggies, avocados, eggs, cheese and chicken with this tasty and hearty Cobb salad. It can be prepared in a jiffy and is ideal for those days when you don’t have much time for cooking dinner. Your kids are bound to love the crunchy and savory taste of the salad. Lettuce – Lettuce is available all year round and it is a leafy green packed with vitamins and minerals. Eggs – Eggs form an important part in a nutritious meal for kids. Eggs are a great source of high-quality protein that has numerous benefits of kid’s health. Why should you make it – If you are looking for a healthy one dish dinner for kids then you can opt for fired rice. This is a highly versatile dish and you can never go wrong with it. Just choose a healthy rice variety like brown rice and add the ingredients that your kids prefer – chicken, eggs, shrimps, vegetables, nuts and you have a nutrient-rich meal at your disposal. Rice – Most of the health benefits of rice for kids can be attributed to its B-complex vitamin content. It also acts as a source of high energy and proteins. Shrimps – These tiny crustaceans are an important source of antioxidants and cancer-fighting minerals. Why should you make it – The classic zucchini lasagna is a great way to include more vegetables into your kid’s diet and is ideal for a special weekend dinner. It is a versatile dish where you can add other vegetables of your choice such as carrots, tomatoes, eggplant in order to enhance the nutrient quotient. Zucchini – Zucchini is an easily digestible vegetables and great source of calcium, B-complex vitamins, phosphorus and vitamin C.
Calcium – Important for development of bones in kids. It also aids in growth healthy teeth and gums. B-complex vitamins – Useful for energy production. Why should you make it – This is the ultimate comfort food for your kids which is not only filling, but also packed with fiber and nutrients. It contains the goodness of green beans, peas, corn and veggies topped with mashed potatoes and creamy cheese. Green beans – Green beans are a great source of vitamin K along with fiber and proteins that are essential for growth and bone strength of your kids. Potato – Potatoes are a great source of carbohydrates for kids, even better than rice and pasta. Why should you make it – Simple and delicious broccoli pasta is the best way to usher your kids to the dinner table. This crispy and creamy pasta is packed with appetizing flavors and nutrients from the broccoli. And the best thing is you can store the left-over for several hours and simply reheat it before eating. Broccoli – Broccoli is the perfect vegetable in all respect and it is a great source of calcium, potassium, vitamin A and C.
Why should you make it – Burrito bowls are a quick and easy way to load up on veggies, rice and legumes – all in one dish. It is a filling, healthy and tasty dinner recipe that your kids will surely enjoy. Make your own chipotle cream sauce at your home and add it to the rice and your dinner is ready. Brown rice – Brown rice is much superior to white rice in so many ways. It is packed with fiber, vitamin E, B6 and magnesium along with protein. Black beans – Black beans are a rich source of high-quality protein. Protein – Helps to maintain and replace tissues in the body, promotes cell growth and metabolism and boosts the immune system. Why should you make it – Creamy and delicious and cheese is an all time favorite with kids. This recipe adds a healthy and wholesome touch to this easy dinner recipes with the inclusion of spinach and artichoke into it. Spinach – It is the healthiest of leafy greens that is loaded with iron, vitamin C, folate, beta-carotene, B-complex vitamins, magnesium and potassium. Iron – Essential for hemoglobin formation, the oxygen-carrying component of the red blood cells. Beta-carotene – Necessary for eye health and good vision. Artichoke – Artichokes have the highest level of antioxidants and fiber compared to any other vegetable. Why should you make it – The juicy and delicious Sloppy Joes are extremely popular with kids. This recipe is so easy to put together that you can make it every time you are running late for dinner. The idea of sandwiching spiced turkey between hamburger buns is simply wonderful and it works great for both lunch and dinner. Turkey – The high-protein content and nutritional value of turkey makes it a healthy choice for kids. Why should you make it – Kids never say no to pizza. This particular pizza recipe delivers big on nutrients while keeping it tasty at the same time. You can include the vegetables of your choice – carrots, celery, tomatoes, etc. put them into a blunder to prepare a veggie sauce and spread it over the crust. Top it with cheese and desired toppings and your lip=smacking pizza is ready. Mushrooms – Mushrooms are available all year round and are loaded with iron, vitamin D and antioxidants. Why should you make it – This one-dish meal is high in protein and nutrients and can be enjoyed by the whole family. The chicken and quinoa makes a delicious combination and the cashew toppings give a nice crunchy texture to it. You can enhance the healthy quotient by adding more veggies to it. Quinoa – Quinoa is known for its high protein content. It is also a good source of vitamins, minerals and antioxidants. Cashew – These delicious tasting nuts are well known for their numerous health benefits and advantages for the human body. Vitamin E – An important antioxidant that neutralizes cell damage caused by free radicals. Why should you make it – Kids usually hate the smell and taste of cauliflower, but here is a easy and scrumptious way to make your kids fall in love with this cruciferous vegetable. Coated with yummy cheese and baked to perfection, it takes the same old cauliflower to a whole new level. Cauliflower – Cauliflowers gives your kid’s diet a complete nutritional boost and helps in maintaining overall health. Why should you make it – Swap the greasy and spicy fried fish with this classic baked hake and oven chips recipe – the all-time favorite dish of the British. The heck fillets have a nice meaty texture and mellow sweet taste. The sprinkle of salt, freshly ground black pepper and lemon perfectly complements the nice crispy texture of the baked fish. Serve it with chunky potato chips and you have the perfect meal for your kids. Fish – Fish is a highly nutritious food packed with vitamins, minerals, proteins and healthy fats that are essential for maintaining good health. Why should you make it – Sausage rolls are hard to resist -be it the kids or adults, this is one quick recipe that is going to be popular with the whole family. The best thing is the sausage rolls can be enjoyer hot or cold making them suitable for both lunch and dinner. The minced sausage blends beautifully with the grated carrots and zucchini and creates a nutrient-packed filling for the rolls. Sausage – Sausage forms a part of the protein food group and when consumed in moderation it can work as a potent source of nutrients that are needed for good health. Why should you make it – The quick and easy stuffed bell-peppers are ideal for weeknight meals when you don’t have time to prepare elaborate meals. The bell peppers not only taste yummy but are also stuffed with healthful veggies and ground beef that will be loved by the kids as well as the whole family. Bell peppers – Red, green and yellow bell peppers are loaded with antioxidants, vitamins, minerals and fiber. Why should you make it – These scrumptious parmesan roasted baby carrots are a healthful meal for the whole family including the kids. The soft tender baby carrots are roasted to perfection and the seasoned with butter and parmesan in order to bring out the sweetness and rich flavor. Dried oregano adds an irresistible flavor to the dish. Carrots – Carrot is a popular root vegetable that is produced throughout the world. It is a wonderful source of vitamin A and offers numerous health benefits to kids. Why should you make it – This is one of the simplest and healthiest vegetable dishes you can make for your kids and it tastes amazing. Kids love spaghetti. The long strands of spaghetti squash cooked in garlic and butter tastes much better than real spaghetti. The strands of the squash add a nice crunch to the dish. Spaghetti Squash – Spaghetti squash is nutritionally superior to regular pasta because of its rich dietary profile. Why should you make it – Kids can be picky eaters and they often turn up the nose to fish. So, here is a quick and simple recipe that will convince your little ones to eat more fish. The plain and neutral texture of the white beans goes well with the tuna and adds bulk to the salad. The lemon juice and olive oil mixture seasoning adds the irresistible flavors to it. Tuna – This delicious fish boasts of an impressive content of vitamins, minerals, nutrients and other health-benefitting organic compounds. Why should you make it – The perfectly roasted asparagus and tomatoes seasoned with balsamic parmesan will be approved by your kids and loved by the whole family. Roasting enhances the natural sweetness of the asparagus and makes for a perfect meal or side-dish. This recipe is incredibly simple and yet packed with flavors. Asparagus – Asparagus is a highly nutritious plant that is loaded with vitamins, minerals and antioxidants. Why should you make it – This is a healthy and fast vegetarian meal that even meat-lovers are going to enjoy. The nice crisp and creamy filling with a delicious sweet and smoky touch is bound to be a favorite with kids. Just put them into whole-wheat tortillas and serve with sour cream, Greek yogurt or spicy salsa. Sweet Potato – Sweet potatoes are considered a wonder-food for kids that deliver a number of health benefits. Why should you make it – This recipe is a great way to include more protein-rich sea food into your kid’s diet. The dish is super-easy to prepare and tastes heavenly. The seared skin of the salmon adds a nice crunch to the fish while the shrimps and veggies add a nice chewy texture to it. Salmon – Wild caught salmon is the healthiest of fish and it packs a considerable amount of nutrients. Why should you make it – This one-dish meal packed with the goodness of shrimps, rice and cheese is a treat for kids. The shrimps add a nice chewy texture to the dish and the addition of garlic butter makes it all the more flavorful and appetizing. You can use white rice or opt for healthier versions such as brown or wild rice for preparing this dish. Shrimp – Shrimps are protein-rich, fast-cooking and extremely mild sea foods that taste good with rice and sauces. Why should you make it – The one-opt meal recipe works as a quick dinner and it is loaded with the goodness of eggs, potatoes, kale and goat cheese. Serve it with crusty bread and watch your kids clear their plates in no time. If your kids are not so much into spicy foods then go easy on the chili powder. Eggs – The health benefits of eggs needs no new introduction. It is a source of complete protein along with other nutrients. Why should you make it – Tried the stuffed bell peppers are it clicked with your kids? Then they will like the stuffed portabella mushrooms even better. The chewy and soft mushrooms taste almost like steak and when topped with wholesome quinoa, veggies and cheese, they make a delightful dinner. Mushrooms – Delicious Portabella mushrooms are available year round and they are a nutritious addition to your kid’s diet. Why should you make it – This is a quick and easy weeknight recipe with great taste and amazing flavors. The nice crispy parmesan crust enhances the taste of the fish. Tilapia has a naturally sweet taste and fibrous texture that will be loved by the kids. Tilapia – Tilapia is a tasty, lean white fish that that is packed with healthy unsaturated fats, calcium and protein. Protein – The protein in tilapia is considered compare protein that contains all the essential amino acids that are necessary for growth and development of your child. Why should you make it – Packed with irresistible flavors, this savory and tangy stuffed tomatoes are easy to make and great for lunch and dinners. It is a great way to introduce move veggies and proteins into your kid’s diet. You can cut down on the Jalapenos if your kids don’t eat spicy food. Tomatoes – Kids love the sweet and tangy taste of tomatoes and these juicy fruits are no less on the nutritional quotient. Why should you make it – Cut out the boredom of the same old lunch and dinner with this delicious and wholesome flat pita bread dish topped with flavorful herbed cottage cheese, fresh asparagus and creamy cheese. The whole wheat pitas used in this recipe boost the health quotient of the dish while the combination of herbs – parsley, basil, chives and dill render irresistible aromas to it. Cottage Cheese – Cottage cheese is considered a natural super-food for kids packed with high-quality protein and calcium. Why should you make it – The delicious and deep flavors of Brussels sprouts mixed with rich parmesan and tangy lemon creates a healthy and appetizing dinner for your kids. The crunchy texture of the Brussels sprouts goes well with the rich and creamy taste of the cheese. Brussels sprouts fall under category of cruciferous vegetables and it offers a unique composition of antioxidants and nutrients that promote good health in kids. The food your children eat in their early years can influence their dietary habits and over-all health later in life. As a parent, it is your duty to ensure that your child’s nutritional requirements are met. And the best way to do it is by serving them healthful home-cooked breakfast, lunch and dinner – each containing some ingredients from each food group.